The most common way of constructing portfolios is to use traditional asset allocation strategies, which match the client’s risk appetite to a weighted allocation strategy of fixed income, equities, and other types of assets. This method focuses on how the money is allocated, rather than on future returns. The Sortino method presents an innovative change from this traditional approach. Rather than using the client’s risk as the main factor, this method uses the client’s desired return. • Software to implement the portfolio construction method is included free of charge to book buyers on a password protected Elsevier website. Book buyers can use the software to construct portfolios using this method right away, in real time. They can also load in their current portfolios and measure them against these measures. 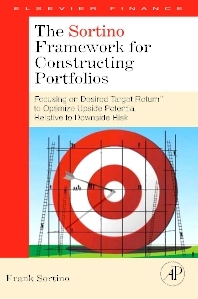 • The Sortino method has been tested over 20 years at the Pension Research Institute. Portfolio managers can be confident of the success of the method, even returns in the economic crisis, in which the method has still beaten all S&P benchmarks. Chapter 1. The Big Picture. Chapter 2. Getting All The Pieces of the Puzzle. Dr. Sortino founded the Pension Research Institute in 1981, focusisng on problems facing fiduciaries. He is also Professor of Finance Emeritus at San Francisco State University. He is known internationally for his published research on measuring and managing investment risk and the widely used Sortino Ratio.